I received notification from Craftsy this morning about a new modern quilting class taught by Elizabeth Hartman. I signed up immediately! Not only did I sign up, I also started the first project, Scattered Squares. I thought I’d make a table topper for our coffee table, which has seen better days. I initially thought I’d throw in punches of turquoise but they were over powering so I just stuck with orange. After I got it all sewn together, I excitedly put it on the coffee table and stood back to admire my work. It just doesn’t work in our living room. Our sofa is red leather, I thought it would be mod but it’s not, it’s just too bright for the space. Ah well, I’m going to finish it and put it up for sale then start another one with different fabrics. Elizabether Hartman is an excellent teacher, her speaking is clear and concise, no um’s or ah’s, you can tell she’s done this before. I thought it was interesting that she pressed all her seams open. I’ve done that before but I prefer the old quilter’s method of nesting seams, I feel they’re stronger though it doesn’t really matter after you’ve quilted your work. 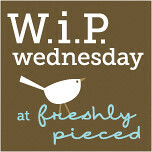 A little late in the day but I’m going to link up to WIP Wedensday hosted by Rebecca this week. Also, for the first time, I’m linking up to The Needle and Thread Network. This entry was posted in Craftsy, W.I.P. Wednesday and tagged Elizabeth Hartman, Oh Frasson by Tabatha. Bookmark the permalink. 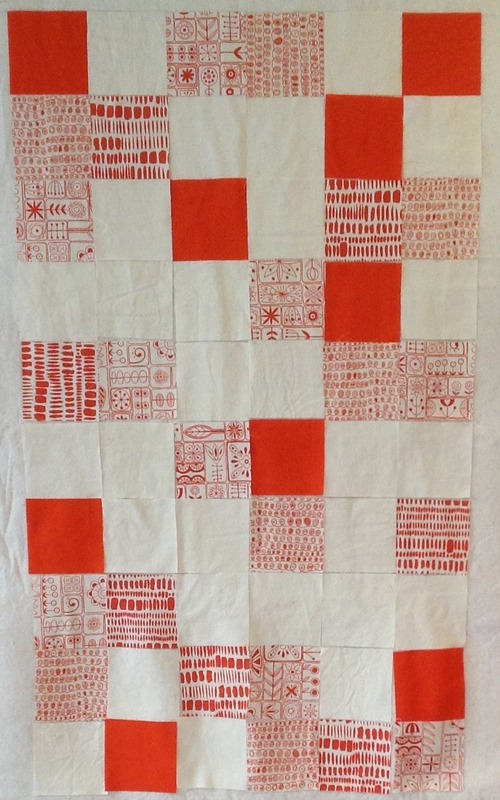 I really like your scattered squares quilt top…the fabrics you have used are are lovely and I like the the one colour palette with the white:. . Thanks Mary Ann, I also signed up for the TNTN RSS feed. That quilt is really nice, too bad it doesn’t work for your space. I love your scattered squares, big fan of red and Summersville! Thanks for linking up to WIP Wednesday.